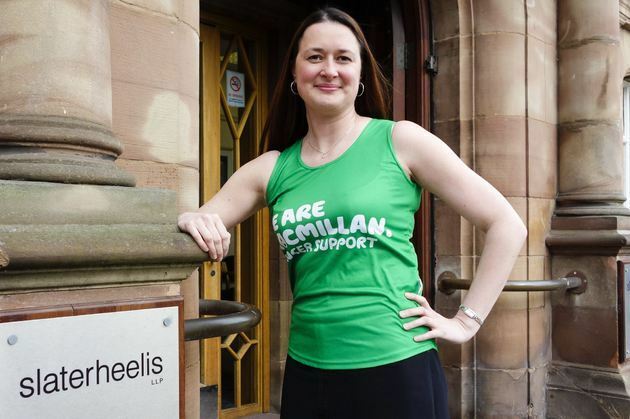 Slater Heelis LLP Partner Rebecca Sharp has become known in the firm’s Manchester offices as the Lawyer in Lycra, thanks to her dedicated training programme to run the London Marathon on 13 April 2014 to raise funds for Macmillan Cancer Support after battling cancer herself. Since being diagnosed with cervical cancer in May 2006, Becky, 28, has been fighting the disease and is now in remission. Throughout her treatment and recovery she received extensive support from Macmillan Cancer Support, and the Macmillan nurses have helped her and her family though a very difficult time. Becky is now determined to run the marathon to fundraise for Macmillan to help ensure that other cancer sufferers are also able to benefit from the support and care of Macmillan nurses. A keen runner before her diagnosis, Becky also believes that exercise is what has helped her to stay well and strong, both physically and mentally, and has kept up a strict training regime for the past year, even running on Christmas Day! Becky will be cheered on at the Marathon by members of her family and is hoping to beat her target time of 4 hours and 45 minutes.